Can it really be true that Brits no longer find Marbella costs too much, Provence too pricey nor the Costa Brava too costly? New research from Experian CreditExpert suggests that 9.3 million more British adults will be going on a summer holiday this year than in 2011. That’s two thirds of adults (65%) – up from a figure of 47% from a similar survey two years ago. Cost-conscious holidaymakers are using some savvy tactics to get their money’s worth: a quarter of holidaymakers (25%) are booking early to cut the cost and spread payments, a fifth (22%) are deliberately travelling out of season, and more than one in 10 (11%) are booking last minute. 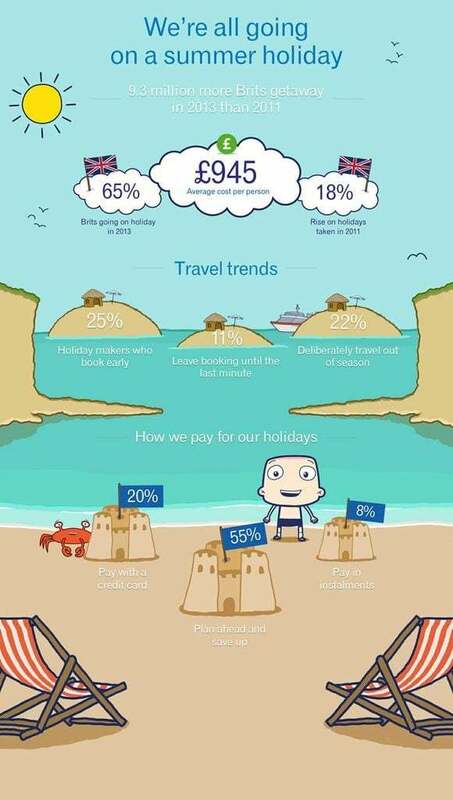 The research finds that the upfront cost of a summer holiday is now, on average, £945 per person – yet a fifth (20%) are bagging a bargain by getting one for £500 or less, with the majority (55%) planning on spending £500 or less, and one in seven (14%) saying they’ll spend less than £200. Many are finding ways to spread the cost, with around one in five using a credit card to pay for their main holiday, with a further one in 10 (8%) paying in installments. Although most Brits going on holiday this year spread the cost over up to three months (51%), many take far longer. One in six (16%) take more than six months to pay it off, and three per cent, or more than a million Britons, say they will still be paying off their previous holiday when they jet off on their next one. If you do use a credit card to help spread the cost of a holiday, it’s best to stay within the agreed credit limits and always make your repayments on time, paying more than the minimum off your credit cards each month if you can, as this could help pay off your debts quicker. Missed payments stay on your credit report for at least six years. Only making the minimum repayments and using more than a third of your available credit limit can both have a detrimental effect on your credit rating – which could hamper your future financial – let alone holiday – plans. Keeping an eye on your credit report will also let you know whether your dose of sun, sea and sand is having an effect on your finances. The 2013 research was carried about by YouGov Plc on behalf of Experian. Research was conducted among 2,111 adults from 17 to 19 June 2013. The survey was carried out online. The figures have been weighted and are representative of all GB adults. There are 48,844,900 UK adults (ONS). 65.33% of adults are going on a main holiday in 2013 (YouGov). 0.65 x 48,844,900 = 31,910,373. 47% of adults went on a main holiday in 2011 (ICM Research conducted online in January 2012 among a representative sample of 2,029 adults on behalf of Experian). The UK adult population in 2011 was 48,091,600 (ONS). 0.47 x 48,091,600 = 22,603,052. Therefore 9,307,321 more adults will be going on holiday this year than in 2011. 20.25% of holidaymakers will be paying for their main holiday on a credit card. Therefore 31910373 x 0.2025 = 6,461,851.